1. Beat egg whites until firm enough to hold their shape. 2. Gradually add caster sugar and beat until dissolved. 3. Fold in crystal sugar, cornflour and lemon juice. 4. Pipe or pile onto an oven tray covered with baking paper. (Form into a shell to hold filling). 1. Dice pineapple and boil with 1/4 cup sugar and water until tender (approx. 10/15 minutes). 2. Drain pineapple and add sufficient water to drained pineapple liquid to measure 3/4 pint. 3. Put the liquid on to boil with margarine, grated rind and juice of lemon. 4. Mix cornflour, sugar and salt with a little cold water, blend until smooth and add to boiling liquid, stirring well. 5. Add egg yolks and cook for 3 minutes. 6. Lastly add diced pineapple and allow to cool. 7. Pile into meringue shell and decorate with whipped cream and cherries. NOTE: Pavlova meringue shell is delicious served with fresh fruit salad and ice cream, or any tinned fruit, or any fruit in season. May also be filled with chopped ice cream and caramel sauce. The recipe was broadcast to Sydney back into 1960 on the ABC Radio program ‘Woman’s World’. As pavlova was such a quintessentially Australian dessert (yes, I have seen the arguments that it was invented in New Zealand – and I’m quite happy to believe that it was), this recipe would have been a must for radio listeners! Personally, I think the whole pineapple filling thing here is overkill. Just top the meringue with whipped cream and fresh fruit – it’s beautiful. 1. Make sure you separate the egg whites out very carefully. NO bits of yolk. Fresh egg whites are a must. 2. Once the meringue has cooked, turn off the oven, open the door and let the oven and meringue cool down together. 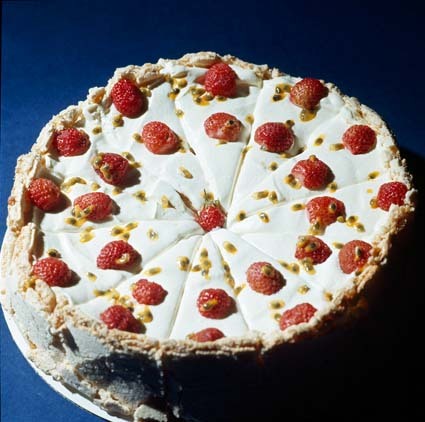 This entry was posted in 1960s, New South Wales, recipe and tagged cookery, food, meandering martha, pavlova recipe. Bookmark the permalink.